Welcome to the Home Page of Breffni House Pets. 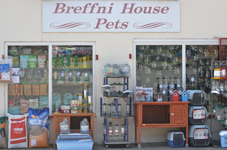 Breffni House Pets is a family run pet store, located close to Dundrum Village, and five minutes from the M50. Establised in 1986, Breffni House pets has always maintained the belief of ‘quality service providing quality’. All of our staff are avid animal lovers, and are thoroughly knowledgable in their respective fields. If you need friendly, unbiased advice on any issue regarding your pets or your gardens wildlife, there is always someone here to guide you, willing to lend a helpful hand. With an immense choice of products to choose from, you’re guaranteed to fill your animal desires at Breffni House Pets. With brands like Royal Canin, Hill’s Science Plan, Arden Grange, and The Nuttery, its easy to see why customers leave the store with a smile and always come back. Breffni House Pets, Windy Arbour, Dundrum, Dublin 14.